wah so late.......>_<""......pandai now they dont shout it out loud liao.....many stuff bo this sales? or just same like previous one? not many stuffs, last year better..
perfumes got plenty.. but expensive.. 20ml already rm90 or 95.. imagine 50ml how much ..
there's jadore, faranheit, dior addict, dior addict 2..
im still using the dior palette (crew/flight palette) from last year! hi miu! 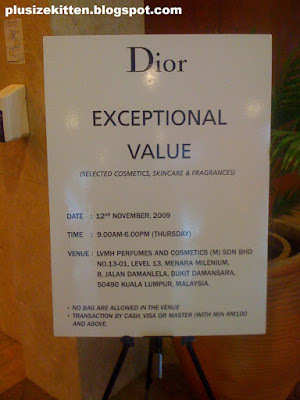 issit true dat dior gonna do sale this sat? wish ive known this earlier! i was waiting for this sale for soooooo loooonngggg!! !